Truth be told, up until I started writing this strip, I was in the same boat as Duff. Here’s a link in case you’re wondering what this is. I spend more time on You Tube than Facebook these days. Sad. I remember that one. Great strip. I tend to agree with Carl. I’ve never come across a real bear in the forest so they can’t be real. I also now believe that all the bears I’ve seen in zoos, on TV & in National Geographis magazines are just these crazy Romanians in costumes. Oh… Here’s another thought. I don’t think they are actually costumes guys. Every dressed up Romanian is in what looks like real bear skins. 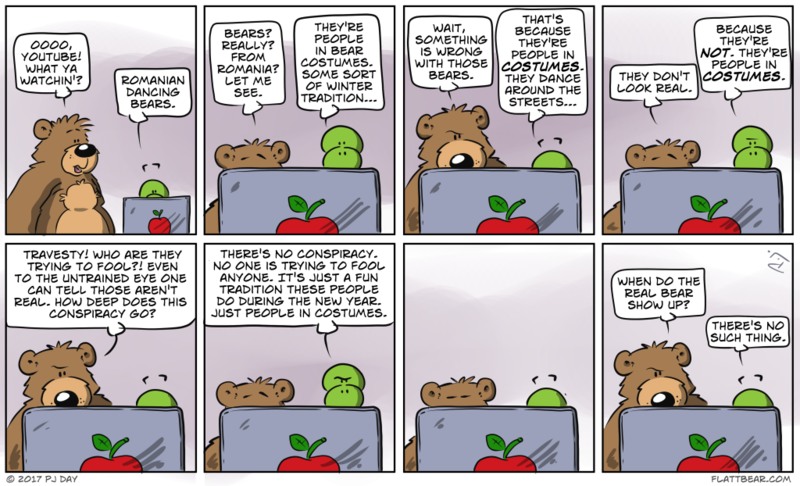 Therefore every dressed up Romanian represents a dead bear. Watch out Duffy!!! Don’t go to Romania & if you come across any Romanians where you live, RUN FOR YOUR LIFE!!! They are real bear skins, yes. And apparently, they are all handed down from generation to generation. I’ve read it takes the place of real bear prancing down the street. Definitely sounds good to me. He is easy to side with, isn’t he? How long before Duff clues in that some of his relatives must have been skinned to make those costumes? That’s funny, because that was my original gag, but I couldn’t make it work. Dancing Bear? Next thing you know, we have Flying Squirrel. Maybe Moose even. As long as Boris and Natasha don’t show up, we’ll be ok.